Three women, Judy (Jane Fonda), Violet (Lily Tomlin), and Doralee (Dolly Parton), kidnap and turn the tables on their sexist boss, Franklin Hart (Dabney Coleman), after he tries to blackmail them. "Nine to Five" is a workplace comedy directed by Collin Higgins. It stars Jane Fonda as Judy, a recently divorced former housewife entering into the workforce for the first time in a long time. It also stars Lily Tomlin as Violet, a long-time employee of her company who has hit the glass ceiling as the men she trains get promoted above her, and Dolly Parton as Doralee, a married secretary who is constantly sexually harassed by her boss Franklin Hart, played by Dabney Coleman. As you can see, this film is focused on women working in white collar jobs who are often passed over for promotions, are underappreciated, are treated as less than equals to their male counterparts, and are sexually harassed due to their gender and based on the way they look. This is a film we could see being remade in 2016 without so much as batting an eye. Of course, this incarnation of the subject matter was made at a time when things like sexual harassment were a lot more prevalent and not always looked down upon. Or was it? Even now, 36 years after the fact, many women face similar issues at their places of employment. 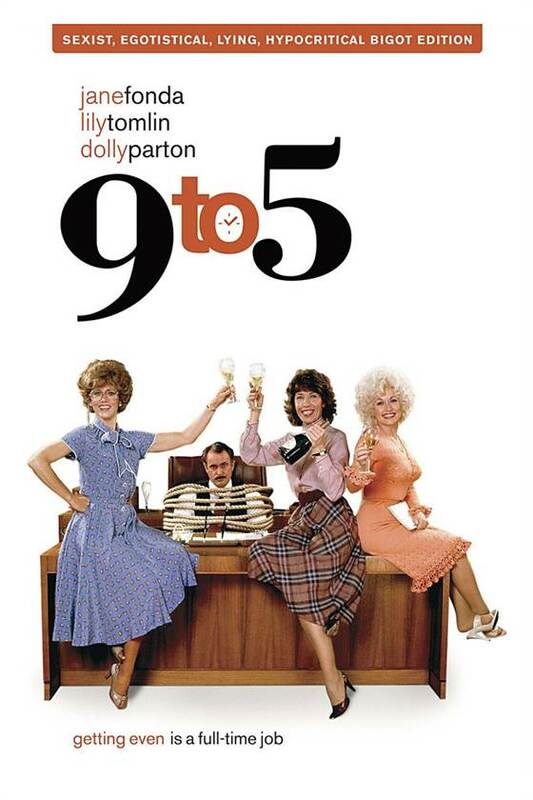 Though we appreciate it for its social message and the way it shows women getting mad as hell for a change, "Nine to Five" is, above all, a comedy, and luckily, it's really quite funny. All three women are not only charming and hilarious individually, but also mesh well as partners in crime and as sisters in struggle. However, despite the fact that it has a mostly lighthearted tone, some of the humor is quite dark and pushes the envelope as far as humor goes like a lot of 80's comedies do. These women who are oppressed by their boss frequently fantasize about murdering him in graphic (but witty) detail. Though their fantasy sequences are quirky and silly, at the end of the day, they are still about murder. At one point, Violet even steals a corpse from a hospital and all three women commit a kidnapping. But humor!!! Luckily, we are sick and twisted individuals who enjoy dark comedies and this particular brand of humor, so none of the darkness of this film upsets us any. Parton, Tomlin, and Fonda have a tremendous and witty repartee together, and even when Coleman and his chauvinistic ways are added to the equation, it's still just as hilarious. There is a delightful nature to "Nine to Five" overall, even with all of the talk of murder, and we really enjoy this funny 80's take on sexism and equality in the workplace.